An Irish man forged an unlikely friendship as he was out shooting this week. Kilkenny native Paul Palmer was enjoying a barbecue with some friends and family on Monday evening when a fox wandered into his garden. “We were going to do a bit of target shooting and I said, ‘That would make a brilliant picture.’ He came right in, and the family was with us and they all found it very funny, so I put it on Facebook and it’s after taking off from there,” he told Independent.ie. 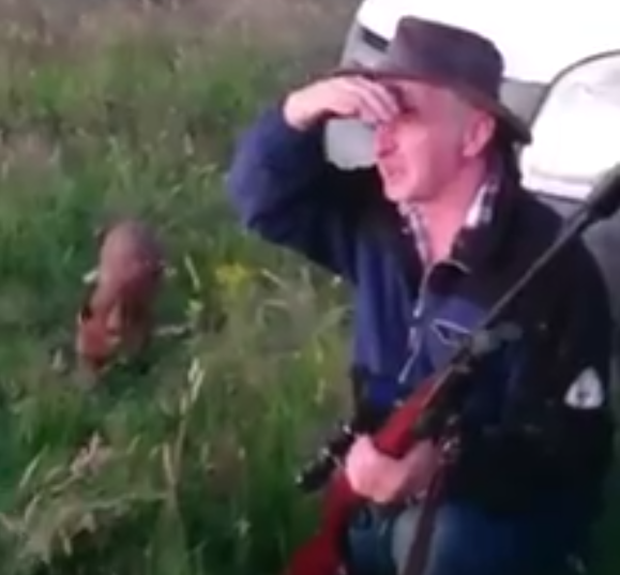 In the video, Paul can be seen doing a fox call while holding a rifle, as the fox sits on the grass behind him. Paul continues to scout around for potential prey before eventually looking over his shoulder and spotting the fox waiting patiently just a couple of feet away. He said it was intended as a joke, and has become fond of the furry creature. “He’s a lovely little lad, he’s really cute and really friendly,” he said. The clip was filmed in the small village of Ballyouskill, and Paul said his new pal has grown famous in the local area. He added that the community are still trying to choose a nickname for the fox. Since the video was posted online on Tuesday, it has picked up more than 500,000 views, and thousands of shares on Facebook. “The reaction is unbelievable, I’m surprised but that’s the beauty of the internet,” Paul said.